The 80s are back, baby! Mom jeans are all the rage, Stranger Things is dominating pop culture, and heck, Star Wars is back in cinemas again too. It seems the 30 year nostalgia cycle is nowhere near waning, and riding that fact all the way to The Other Palace is Eugenius!, a new musical by Ben Adams and Chris Wilkins. Making his UK debut, Liam Forde plays Eugene, a self professed geek from Toledo, Ohio, who has a penchant for the Ninja Turtles and an impressive gift for storytelling. Much to his archetypically hardened yet loving dad's dismay, Eugene is working on a comic about Tough Man, a musclebound He-Man wannabe from a galaxy far away. Despite being constantly bullied by the majority of his classmates, Eugene's talents land him first prize in a national movie pitching competition, and he is whisked away to Hollywood to oversee a big screen adaptation of his story. Things don't get off to the best start in La La Land though, as Eugene's beloved characters are bastardised before his eyes, and a strange otherworldly visitor named Evil Lord Hector arrives on set, straight from the pages of Eugene's comics and hell bent on total annihilation... once his powers have recharged. The plot of Eugenius! is a wild one, there's no doubt about that. It's totally over the top, full of cliches, and ridiculously cheesy, which is far from a bad thing. Adams and Wilkins' script makes the most of every chance it gets to parody all things 80s. In fact, the whole production is painted with a gloriously retro brush, amplifying its over the top nature. Andrew Ellis' lighting design is a visual treat, full of neon brights, with beams of light flashing everywhere, and Hannah Wolfe's sets and costumes do a similarly good job of bringing the era of acid wash and spandex to life. The musical excels once the action moves from the Midwest to LA. It's ridiculously good fun to see behind the scenes of Eugene's movie. With gaudy costumes and hammy acting, Eugenius! lovingly parodies the campy sci-fi which dominated 80s pop culture. It also makes several attempts to offer social commentary on the state of Hollywood today, with varying degrees of success. Scenes featuring Evil Lord Hector along with his sidekick Kevin The Robot are particularly bright spots, brimming with madcap retro fun. Ian Hughes' maniacal manchild Evil Lord Hector deserves a show all to himself, and it's great to hear the voice of Mark Hamill, acclaimed voice actor and, aptly, the star of Star Wars' original trilogy, as Hector's metal babysitter turned henchman. However, some aspects of the script are less brilliantly conceived. Naming the female lead in Eugene's comic book creation Super Hot Lady is an obvious wink to the misogynistic treatment of women in sci-fi a few decades ago, but her objectification by both the heroes and villains of the story sends mixed messages about the morality of any of the musical's characters. Meanwhile in one scene Eugene's comedy relief sidekick school friend Ferris, played with boundless energy by Dan Buckley, pretends to be an agent in order to try and seduce an actress - an uncomfortable plot point, especially in the current post-Weinstein climate. Later in the musical he dips and is kissed by a grown woman. The moment is played for laughs but the implications are uncomfortable. That being said, Eugenius! never feels malicious. It may not always be as clever or savvy as it perceives itself to be, but its overall message is an uplifting one. 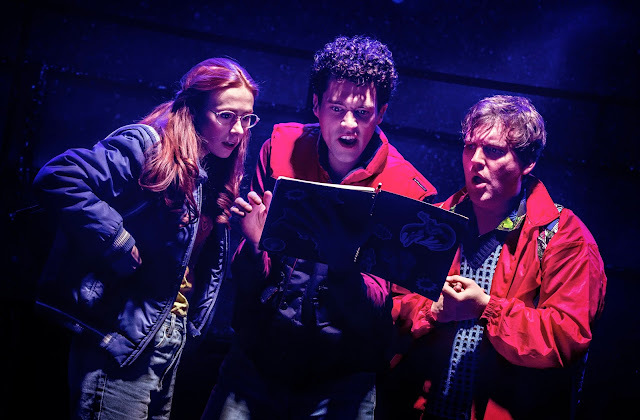 The score is a fun pastiche of 80s tunes, with Go Eugenius, the catchy fist pumping finale, sounding a bit like if Bon Jovi covered a mashup of Bryan Adams' Summer of 69 and Whitney Houston's How Will I Know. If you could bottle the feeling of elation at the end of Eugenius! then you'd make a fortune. It's not without its flaws, but for a bit of fun with a few great tunes and an uplifting finale, Eugenius! is a pretty safe bet.